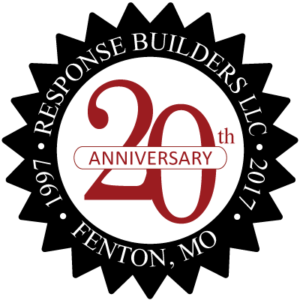 Response Builders is a St. Louis based website design firm specializing in custom Internet marketing solutions. Since our incorporation in 1997, we have grown from a one (wo)man shop to a full website design team. We are proud to support over 100 clients’ website projects, nationwide. All along our goal has remained the same: to make the Internet work for you. We do more than just build website home pages, we develop comprehensive online marketing pieces. We work with you to determine what elements should be included in your website and bring creative ideas to the table. Response Builders gives you the competitive edge by showing you opportunities on the web and providing you with the know-how to take advantage of them. Contact us for a free website marketing consultation. Let Response Builders help you solidify your online marketing objectives and achieve success with your next website. Response Builders has a strategic partnership in place with Saint Louis Computer Repair Service. Let the SLCS professionals help you out with any computer repair issue on any computer brand. Saint Louis Computer Service is conveniently located in St. Louis, Missouri, just minutes from neighboring communities. We offer a full range of residential and business computer, network and IT services. Our goal is to serve the St. Louis community with professionalism and computer repair expertise, building relationships that grow with your needs. We pride ourselves by providing premium, expert service while accurately assessing the challenges of our customers and by satisfying expectations and anticipating future concerns.